We all either knew someone, or perhaps we were that person, who would damn any band with faint praise for being on MTV simply because they were on MTV. Some did it to keep up with the status quo of the elite few that were actually in the know when it comes to music. Others did it simply to stand out and be different even though it was a false sentiment. Emily Strange is the former and she is unlike any character you will read about in a comic book. The story follows Strange as she wins a haunted guitar owned by her favorite musician. The catch is that she has to form a band and win Battle of the Bands in order to keep it. Rob Reger and Mariah Huehner do a phenomenal job of making Emily adorable enough where she doesn’t come off too cutesy while making her likable despite her self-absorbed personality. This, along with her rock n’ roll counter culture state of mind, produces an individual who tends to be the smartest person in the room. These moments shine during her interaction with her bandmates who also carry their weight thus serving the story well. While the late addition of a sixth band member named Trilogy served as the missing piece of the puzzle, it fell flat and took away from the story to a degree because more time was spent giving her street credit by matching musical knowledge with Emily instead of highlighting her talents. Emily Ivie’s art direction was clean, precise and creatively moved the story along at a nice pace. Besides efficiency, you can tell she has fun drawing this book, especially during the scenes in Emily’s lab where her many cats constantly get in the way of her work. These moments are not funny on their own, but it’s Emily’s nonchalant reaction to them that puts a smile on the readers face. This 6” x 9” sleek hardcover will look good in your collection on the shelf and comes with some neat concept art and some vintage looking concert posters of the band. 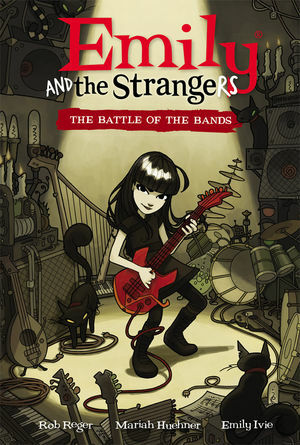 Emily and the Strangers is a well delivered tale that will appeal to comic book and music fans because it speaks to them both on a level that is entertainingly qualified in subject matter. ‹ The Body Slam Podcast Ep 21: Batista, The Streak, WrestleMania 30, Daniel Bryan, and more.